Mosaics have been an inspiration to me since I visited Rome in 1981 and saw a mosaic portrait in the Vatican. At first I thought it was an oil painting, until I got up close. Painting in glass, stone and ceramic is intriguing; it seems impossible, yet it is as beautifully precise and thought out as Seurats pointillism. I started doing mosaic garden art in the mid-nineties with broken pottery on flower pots and small fountains. I realized I wanted to make my own ceramic tiles and so I studied ceramics. Since then I hand-make ceramic tiles with a botanical theme to create garden art in the form of birdbaths, mirrors, hearts, fountains, benches, tables and dishes. 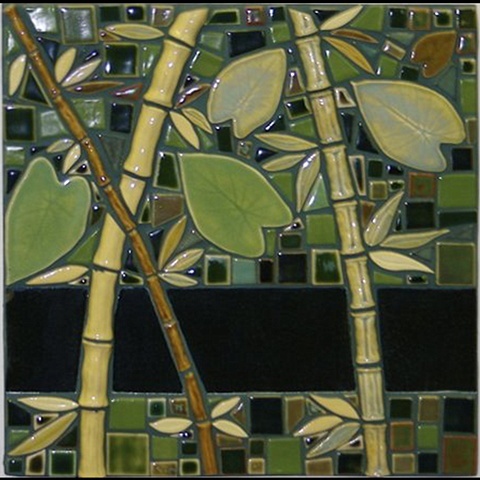 My clay is a mid-range stoneware which means that the tiles are sturdy outdoors year-round. A heart made for my mother ten years ago looks just as it did when I first hung it on the south face of her garage. It has withstood subfreezing winters and summer heat waves. Of course, my pieces also look lovely in a sweet garden room indoors.